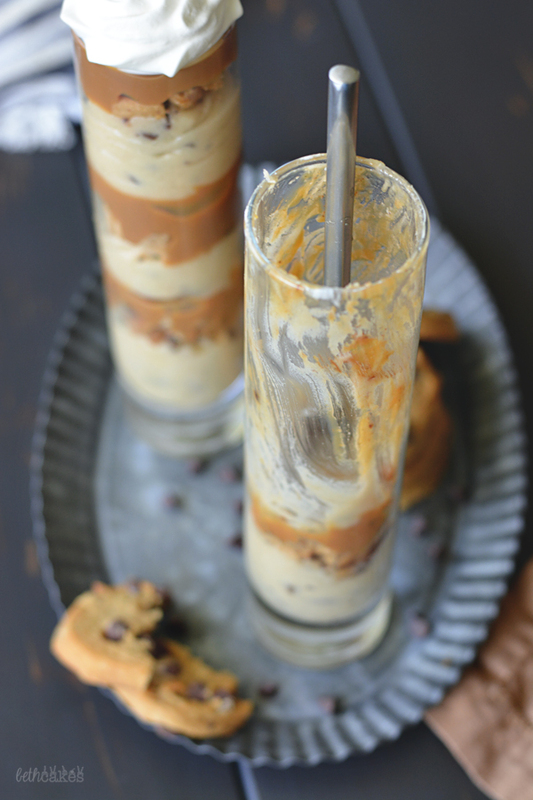 I’ve been wanting to create some trifles like this for quite some time, but could never find any tall and skinny glasses. I was in Target the other day, trying not to look at all their kitchen things, when I happened to look over and these two were randomly sitting there completely out of place. That being said, there is a very real possibility that these are vases. But let’s pretend for now! So about this bourbon caramel sauce. I bought it. From a really cool local dairy farm called Daysprings Dairy. I bought some immediately after tasting it at a festival a few weeks ago and have been hiding it in the back of my refrigerator until I came up with an idea that seemed worthy enough for bourbon caramel. 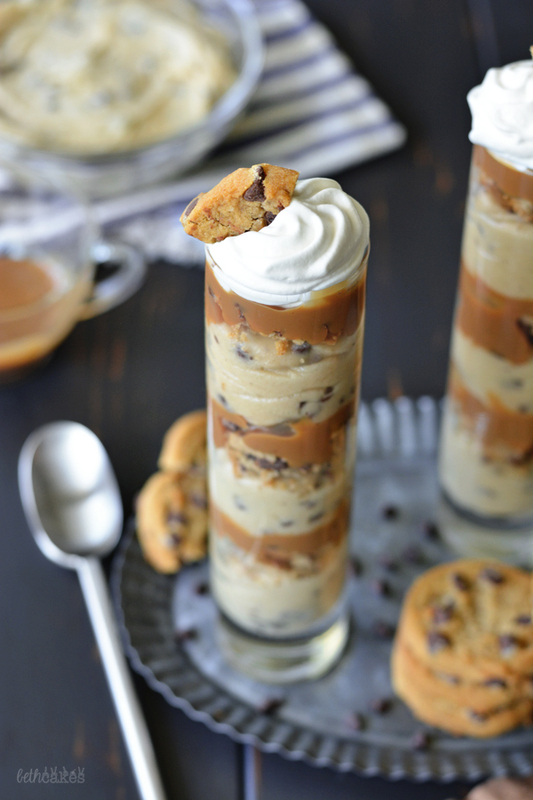 These cookie dough trifles, friends, are totally worthy. They’re like, hammer of Thor worthy. He would just give them the hammer. Like, hand it right over. To the trifles. BUT. 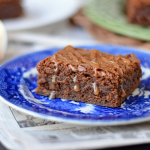 You can make your own bourbon caramel sauce if you don’t have access to the already existing kind. 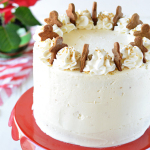 I’ve made this recipe several times, and it even has step by step photos. Just stir a tablespoon or two of bourbon into the sauce at the end. 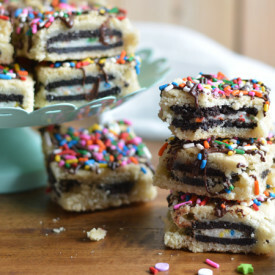 The cookie dough layers in these babies are exactly what you think they are. Eggless cookie dough. Except I made it a little thin and folded in some Cool Whip so it would be fluffier. I used a piping bag to layer these trifles, but that probably won’t be necessary if you use wider cups or a trifle dish. These trifles are the perfect combination of creamy, crunchy, and gooey. It’s really great when you get a spoonful of all three. But, they are not for the faint-hearted. They’re not for your average sweet tooth craving after dinner. 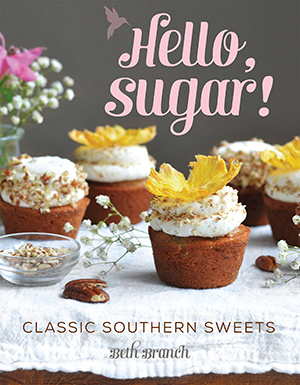 If you really want something sweet and totally indulgent, these are the way to go! 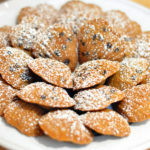 In whatever dish or cups you decide to serve this in, spoon or pipe a layer of cookie dough filling. 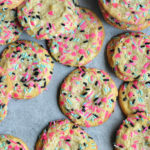 Sprinkle with chopped cookies and drizzle with caramel sauce. Repeat the layers until your container is filled. Cover and chill for 2-4 hours. 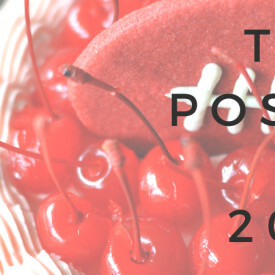 Top 10 Posts of 2015! that looks so over the top amazing!! Yum! 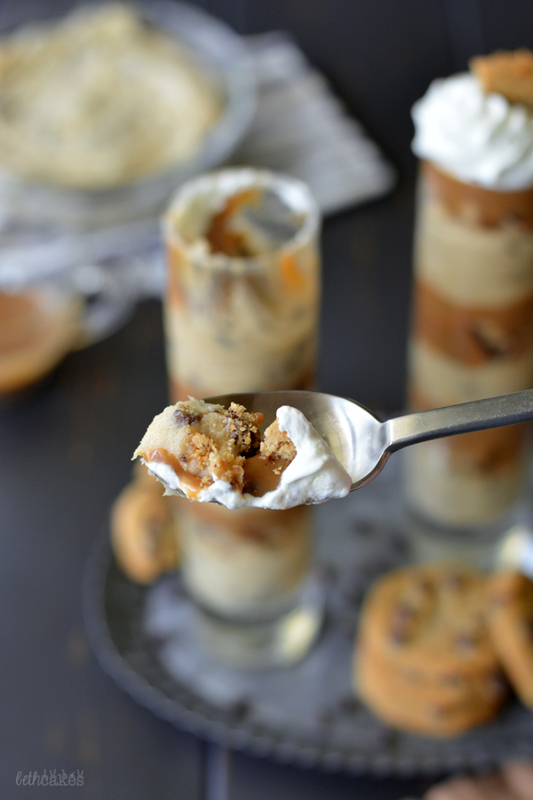 bourbon caramel combined with chocolate chip cookie dough?! You’re reading my mind over here! This looks so incredible! So decadent, and I love those cute little glasses (maybe vases), haha. Pinned! Can this be frozen in advance ? Bring on the cookie dough!!! 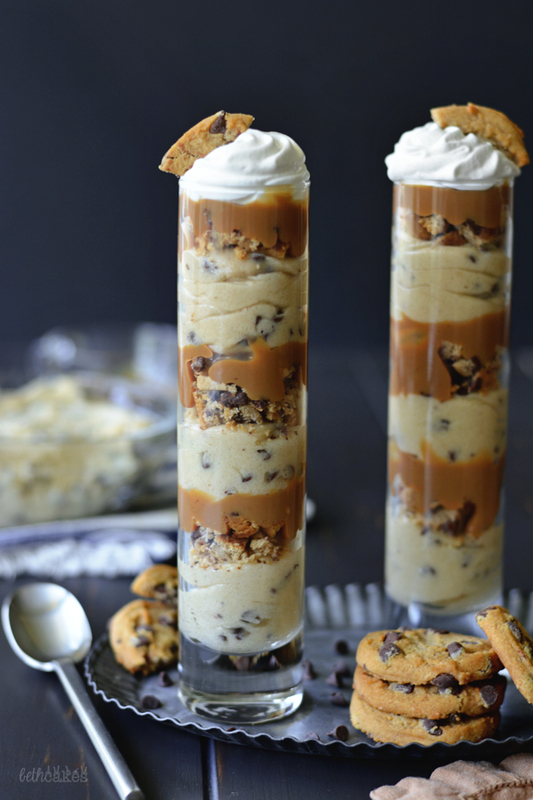 These trifles look amazing! haha target for the win! I give them way too much of my money! 🙂 And vases or not, they are some pretty cool glasses! 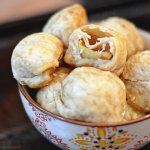 These sound so awesomely good – I’ll take one please and thank you! Oh my gosh, am I in heaven? These look AMAZING!!! I just love those glasses, I need to get myself soon. Over the top delicious! Oh my goodness gracious!!! My birthday is coming up, can I put in an order? I want this! Holy cow. This is mind bogglingly awesome. Pinned!! Just a few of my favorite things all in the same place!! Please tell me you have some left and can overnight them to me!? Holy crap those look awesome! These look so incredible! I bet that bourbon caramel is decadent. And I love your presentation in the skinny glasses! I did notice the flour didn’t make it into the instructions after step 1 though. Do you just beat it in with the butter and sugars before you fold in the Cool Whip and chocolate chips? I bet you had fun with your photo shoot since you got to eat a whole trifle during it! Yummm.